In the early 1970s, Bill and Rose Abbott started donating produce from Elmwood Farm in Hopkinton to hungry families in Worcester County. Over time, their work to increase access to fresh produce evolved into the Community Harvest Project, which in 2012 alone provided 260,000 pounds of produce to the Worcester County Food Bank. The Abbotts set up a trust to ensure that when the time came, the sale of Elmwood Farm would benefit the Community Harvest Project. 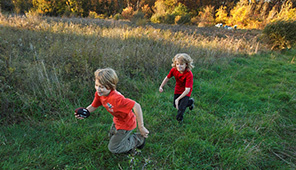 When the Town of Hopkinton expressed an interest in securing the woodland portion of the property, The Trust for Public Land helped arrange the purchase of 81 acres as public open space, preserving the town's rural character and ensuring that the extensive hiking trails will always be open to the community. In 2013, we completed the protection of the remaining farm property, including the historic Rev. Elijah Fitch House.